Dressed in sneakers, blue jeans, a white V-neck shirt and a green conductor cap - mostly speckled with paint - Gordon Harrison is in his happy place. Given his specialty is painting Canadian landscapes, his happy place is whatever or wherever he chooses to paint that day. Today, we're meeting at his home studio in New Edinburgh, Ottawa, ON, but his canvas will take us to Champney's, a quiet town located northwest of Trinity Bay, on the east coast of the island portion of Newfoundland and Labrador. 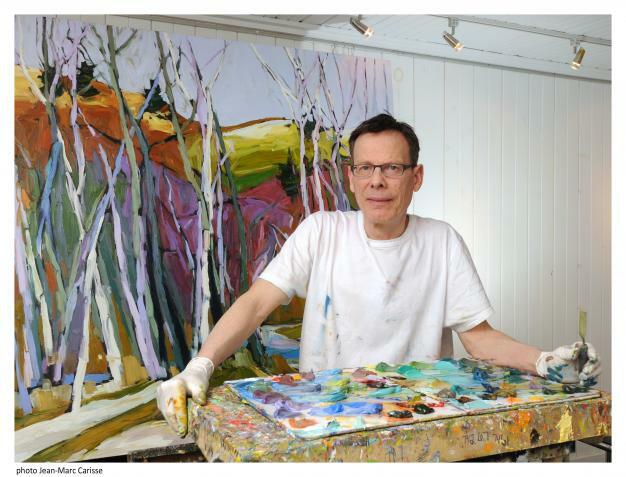 This nationally and internationally acclaimed painter is self-taught, save for a couple of night classes he took more than 20 years ago at the Ottawa School of Art. At the time, he was 38 years old and working full-time for the City of Ottawa, first as a landscape architect (for which he is academically trained), then as an urban planner. While Gordon enjoyed his work (spending 31 years doing it), he yearned to make something more meaningful and tangible of his life. Sitting with him in his home studio - his artwork on every wall, a painting in progress with a fresh palette at the ready along with easels, drop cloths, brushes and oil paints arranged for his group class that evening - it’s impossible for me to imagine him doing anything else. Gordon paints in a style that he calls “Canadian contemporary coloured landscapes,” reminiscent of works by the famed “Group of Seven” - the group of Canadian landscape painters who came together after the First World War, from 1920 to 1933, in what is known as the first major Canadian national art movement. Gordon’s work is inspired by direct contact with nature - a commonality that has led some to refer to the Montreal-born painter as the eighth member of the group. His original pieces can fetch anywhere from $600 to $15,000 each. Now in his 60s, Gordon paints five or six pieces a week. He and his partner, gallerist Phil Émond, own and operate two Gordon Harrison Canadian Landscape Galleries - one in Ottawa’s Byward Market, and one in the Québec Laurentians in Saint-Sauveur. Still he finds time to travel and paint in his favourite locations. Today, Gordon takes me back to his latest destination, which was in June 2015, to Newfoundland’s east coast. At the time, the island was reporting colder than normal summer temperatures, but that didn’t stop Gordon from touring a collection of the province’s towns and outports. Stops in Burgeo, Champney’s, Keels, Tickle Cove, Twillingate and North Harbour inspired the paintings in his 2015 “Seaside Poetry from Atlantic Canada” collection. He shows me a photograph he took of Champney’s and his interpretation of it on canvas, where the rugged landscape is transformed into one beauty of a dreamscape. Dark violet and sap green trees edge the light violet slate and shale mountains, further animated by ribbons of soft mustards, burnt oranges, cherry reds and grass greens. Shades of purple, lime and periwinkle demarcate sea to sky, with a swath of turquoise along the coastline. 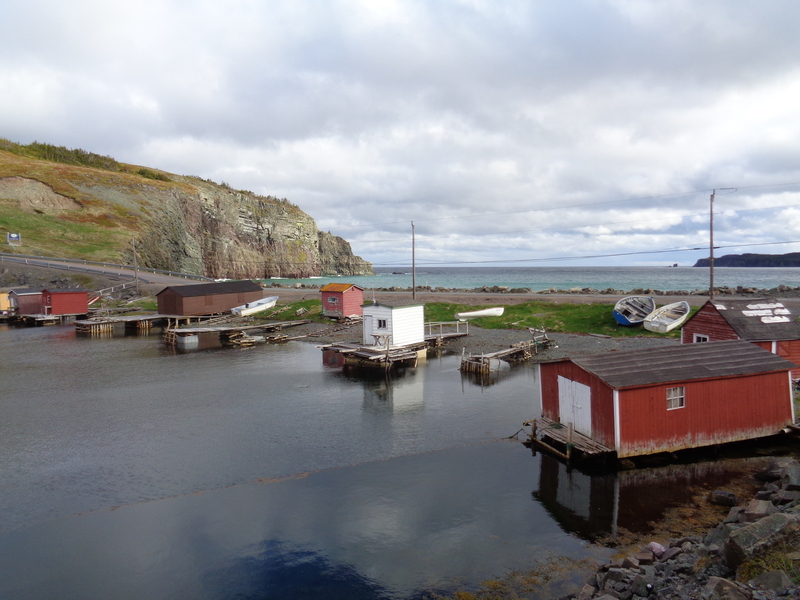 Bright red and white saltbox houses sit on a spit of land amidst wooden docks and dories. His first trip to NL was in the summer of 2000, then again in the summer of 2006, then his return last summer. It’s hard to say what Gordon will see on his next trip. After a decade of enjoying “have” status, the province’s economy has teetered back to its “have-not” days. The oil boom that helped pivot the province to prosperity more than a decade ago has gone bust, while the latest provincial budget hit residents where it hurts - taxes hiked, new developments halted and jobs cut. As of June 2016, the province’s unemployment rate (12 per cent) was still among the highest across Canada (which stands at 6.8 per cent). Copyright © 1996 - 2014 Downhome Inc. All rights reserved. Reproduction in whole or in part without permission is prohibited.